The prompt from #26greatnailartideas was Sunshine. 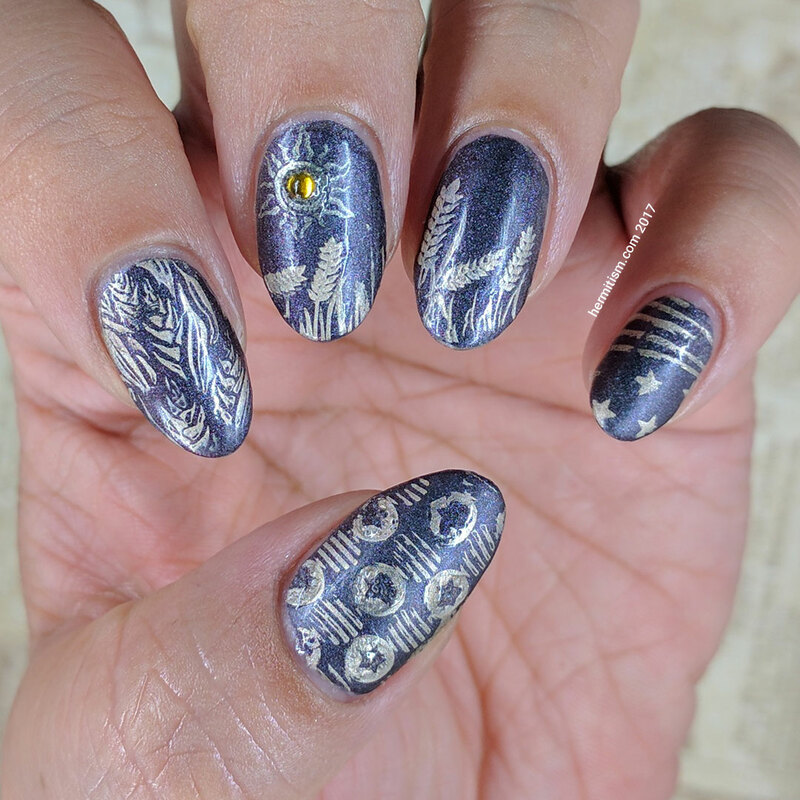 So of course I wanted to do a dark nail art with a grain pattern because I like to picture the crops growing up, nourished by the sun and finally being baked dry by it. A kinder, gentler version of a forest fire finally releasing the seeds of the next generation of trees. #nailartchallengejuly also had a prompt for Your Country. So I decided to combine the two with a song I regretfully have in my head from childhood (America the Beautiful) which references “amber waves of grain”. 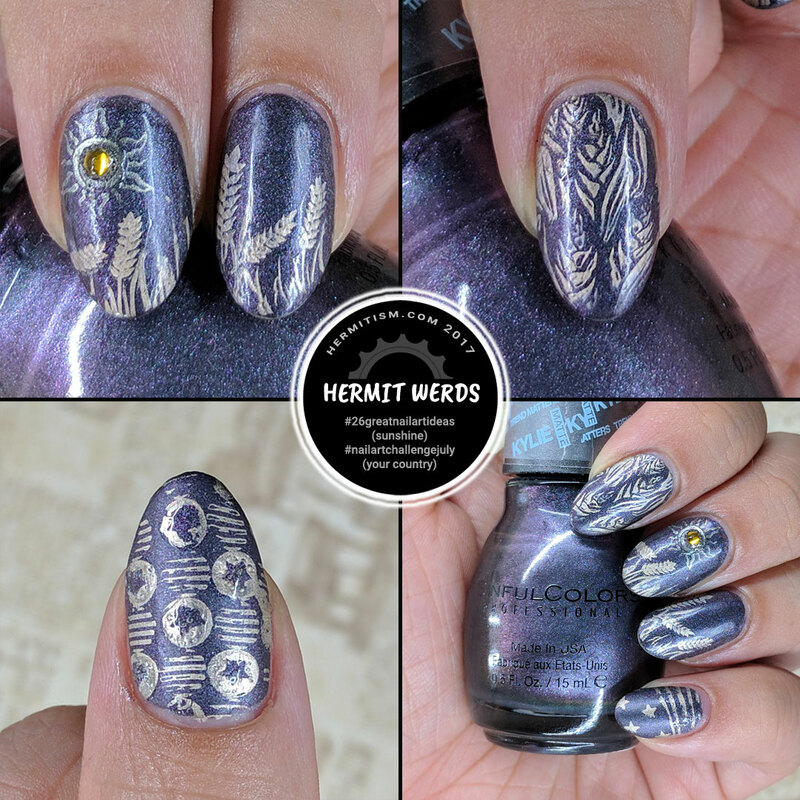 I kept my stamping imperfect for that mass-produced old fashioned printing effect. So vintage. I also wanted to play with a combination of matte and shiny finishes again. I’ve also been thinking about de-stashing “Konstellation” so I wanted to use it to see if it was worth keeping. 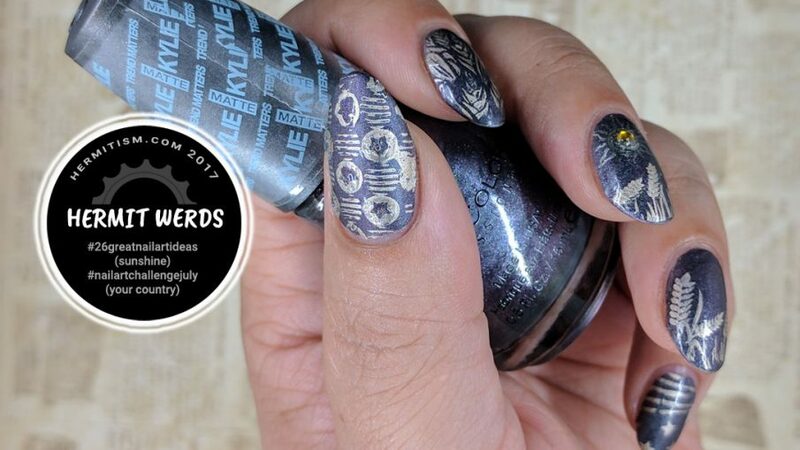 I originally bought it because a lot of YouTube nail artists sang its praises as a true oil slick polish. It’s not. It has purple and green on the nail and that’s it. No yellow and no blue (I can sometimes see yellow in the bottle, but it does not translate). So it can’t meet the requirements of what I bought it for, but it’s still pretty and doesn’t have a difficult formula so I may keep it for a while longer. In the end, I probably will de-stash it in favor of Sally Hansen’s “Black Onyx” though. So pretty! I love the little gem in the sun! I do own the “konstellation” polish, and I like to use it as an alternative to black. It’s really pretty!